Tetraneura are small aphids. The wingless forms have one-segmented tarsi and the winged forms have a simple, unbranched medial vein in the forewing. The 4th antennal segment is usually much shorter than the 5th. Wax gland plates may be present or absent. There are about 30 species in the Tetraneura genus. At least seven of them host alternate between leaf galls on elm (Ulmaceae) and roots of grasses (Poaceae). The remainder are only described from either elm or the roots of grasses. They usually have a sexual stage in the life cycle. 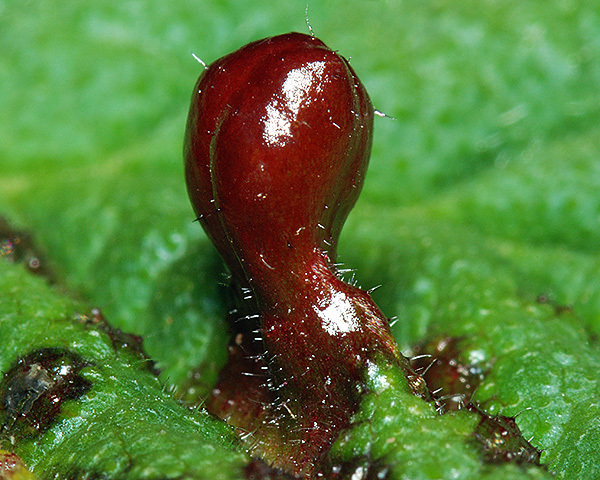 The fundatrices induce stalked, pouch-like red, yellow or green galls on the upper sides of leaves. Tetraneura are not attended by ants. On the primary host, elm, Tetraneura ulmi develop within galls on the leaves. The galls are stalked, approximately bean-shaped, smooth and shiny, and coloured reddish-green and/or yellow (see first picture below). The Tetraneura ulmi fundatrix, which stimulates production of the gall, is light green with the head, thorax, antennae and legs dark and transverse bands of light wax across the abdomen and thorax (see second picture below). The offspring of the Tetraneura ulmi fundatrix develop within their gall to winged viviparous alates (not pictured here) which have a shiny black head, thorax, antennae and legs, and greyish black abdominal segments. The body length of Tetraneura ulmi alates is 1.8-2.6 mm. 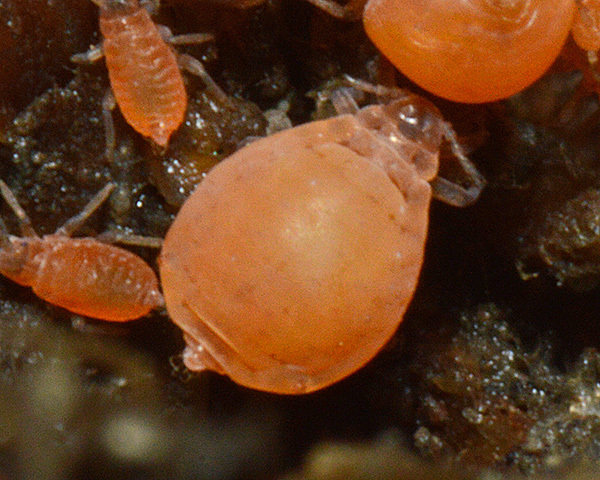 The adult apterae on the secondary host, grass roots, are readily identified, being pale orange yellow, yellowish white or reddish (see third picture above). The head, prothorax and appendages are brown, and the body is (sometimes) lightly dusted with wax. Tetraneura ulmi host alternates. 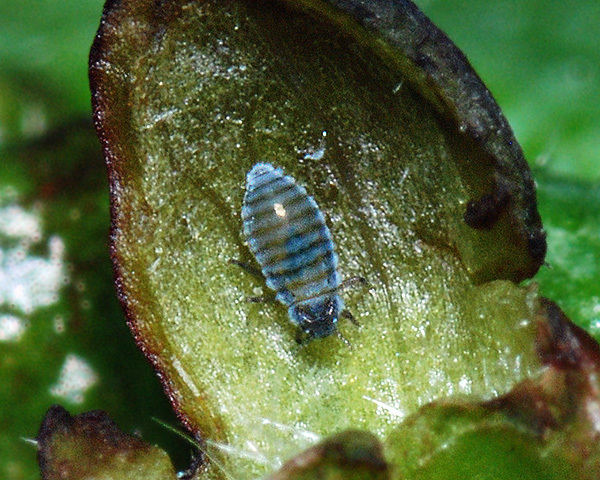 The winged forms of the elm-grass root aphid emerge from elm galls (Ulmus spp.) in June-July to colonize roots of grasses (Poaceae). Populations without sexual forms occur commonly on secondary hosts. In September winged forms make a return migration to elm where they produce larvae which feed on the bark, and mature to apterous males and females. Fertilized females only lay one egg each. Tetraneura ulmi is found in Europe, across Asia to eastern Siberia, and has been introduced to North America.